I am a huge fan of vintage cookbooks. This website does not help extinguish my love. When I found out that the Shannons were doing the Betty Crocker vegan version, you should have seen my face! 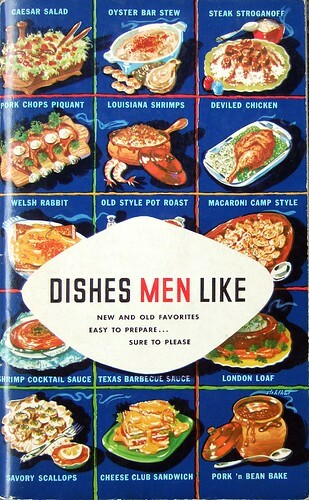 I have this ridiculous old cookbook called, "Dishes Men Like". It is made by Lea & Perrin's Worcestershire Sauce and every single recipe contains their sauce! Clearly, men love these dishes. Of course, I had to attempt to veganize some of them. So far, I have tried shrimp canapes, crab bisque, Caesar salad, and chicken divan. I attempted to follow the recipes as closely as possible. In a medium frying pan, fry the shrimp according to package instructions - about 5-10 minutes. Combine soy butter and Worcestershire sauce in a small bowl. Top the toasts with the mixture, followed by the shrimps. * Note: I used Earth Balance for the soy butter. For vegan shrimp, I used Vegetarian Plus brand. In a medium pot, boil the lobster and oyster mushrooms. Allow them to dehydrate completely. While the mushrooms are on the stove, put the pea soup and soup water on in another medium pot. Stir well. Meanwhile, in a medium frying pan, add the butter and allow it to melt. Next, put in the crab meat, Worcestershire sauce, cayenne pepper, and salt and pepper. Combine well. When you are done dehydrating the mushrooms, chop them into small pieces. Add them to the crab mixture and combine well. Next, add the crab mushroom mixture to the pea soup, followed by a cup of the mushroom water. Let cook for another 5 minutes. Serve. * Note: I used Earth Balance for the soy butter. For vegan crab meat, I used Match Meats. Lastly, for pea soup, I used Fig Food, Co. These are the first few pages of the book. So great! Also to note, I used the lobster and oyster mushrooms in the crab bisque because of their seafoody taste. I wanted to add a little more ommph to the recipe. The original recipe did not call for the mushrooms or the cayenne, otherwise it is the same. As for the shrimp canapes, I choose to fry the vegan shrimp rather than to boil them to give them a little more taste. The original recipe called for just cooked shrimp.